This progression course addresses more advanced composite repair techniques and issues in respect to more extensive and complex structural repairs. Repairs are conducted on solid laminates and sandwich panels using advanced repair tooling, step sanding routers and jigs, standard repair patches and more extensive heat mat/lamp curing of materials. 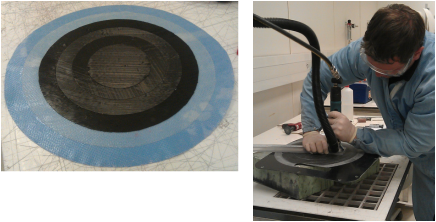 Emphasis is on refinement of the repair techniques and methodologies and working with on-tool extraction and dust containment/control. This is aimed at anyone involved with repairs to composite materials, including repair technicians, supervisors, engineers, designers, researchers and managers. Attendees must have previously completed the course DMSC58, Composite Repair - Stage 1. 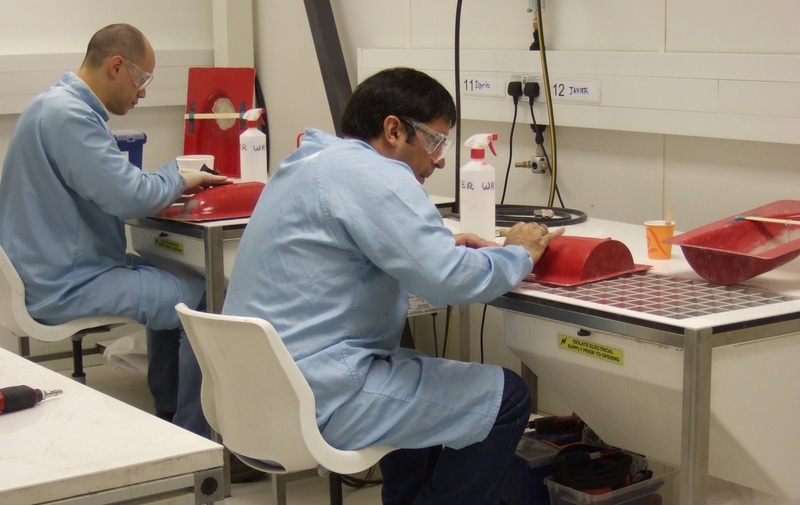 At the start of the stage 2 course we begin with a 30 minute recap of what was covered on the Composites Repair – Stage 1 and then cover approximately 30 hours of practical and 10 hours of new theory and technical demonstrations. You will produce one component yourself in line with the SAE’s AIR4938 standard, 'Composite and bonded structure technician/specialist training document'. This standard was produced by the worldwide 'Commercial Aircraft Composite Repair Committee' (CACRC). Your second component will be supplied by us to ensure that everyone attending the course has consistent components to work with. You will begin by inspecting your composite components using a range of Non Destructive Testing (NDT) techniques. 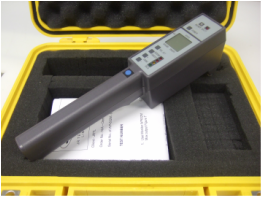 These include tap test using a wood pecker, moisture meter and ultrasonic inspection. The composite parts are inspected before and after applying controlled damage. This is designed to mimic the real life damage a component might incur during normal service. You will be shown what to expect to find when inspecting a composite component and how the various types of damage are categorised. Working with the Step Sander Repair Kit, you will complete discovery exercises (investigating damage and ply lay-up) and then learn how to effectively remove damaged composite material prior to repair. The Step Sander Repair Kit has been developed to improve the quality and consistency of the repair surface by working with jigs, offering a high level of accuracy (0.05mm in depth). As you become more familiar with the equipment, your speed will increase. It will allow you to produce a higher quality step sanded repair, in a shorter period of time, than with alternative tools. We will cover laminate calculations to give accurate resin to fibre ratios. This will ensure material consistency through the parent material and the repaired area, maintaining material thickness and fibre content, essential in good quality repair. Various curing methods are used through the week, demonstrating their effectiveness and advantages in various situations. Surface and envelope vacuum bagging techniques are used with a range of curing methods. These curing methods include using a hot bonder with heat blankets and infrared lamps, autoclave and oven. The repaired components are checked using the NDT equipment and then physically tested to ensure the repairs have been completed effectively. As a group, conclusions are discussed highlighting improvements that could be made, and areas of the repair that have gone well. Feedback is given throughout the course and discussion is encouraged.